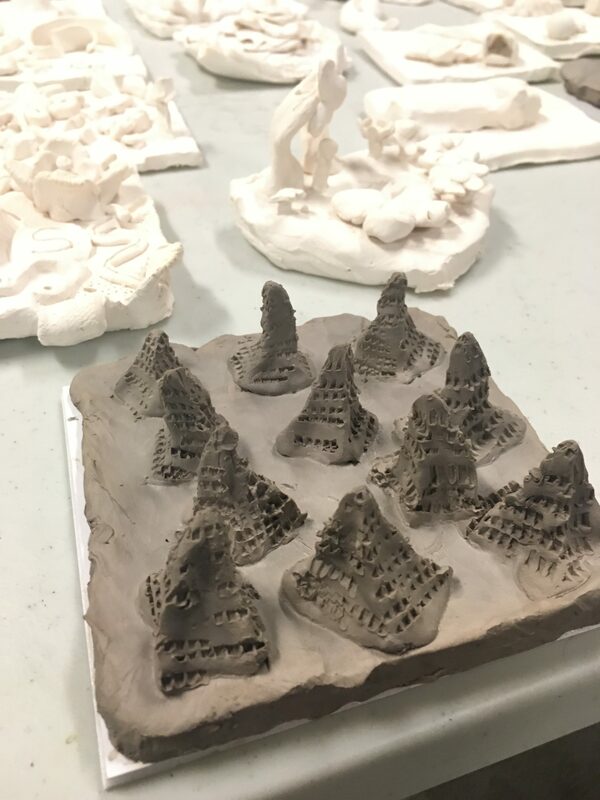 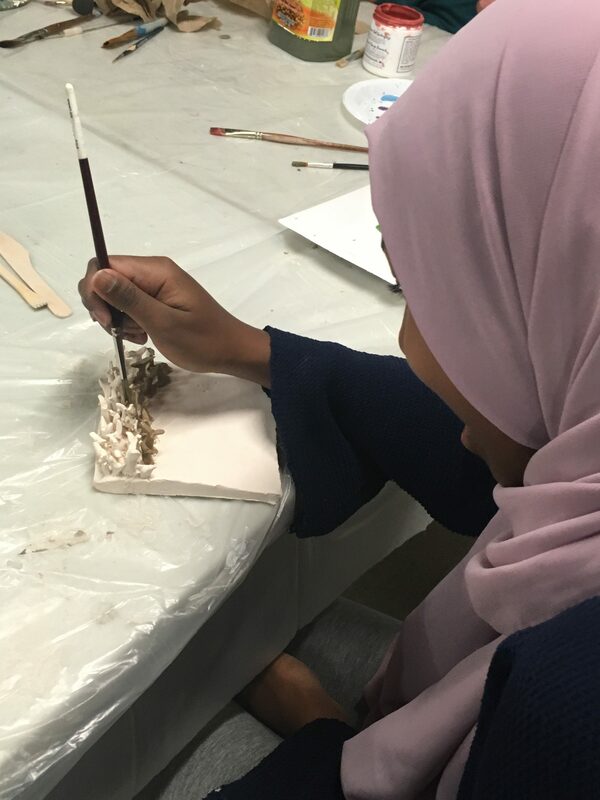 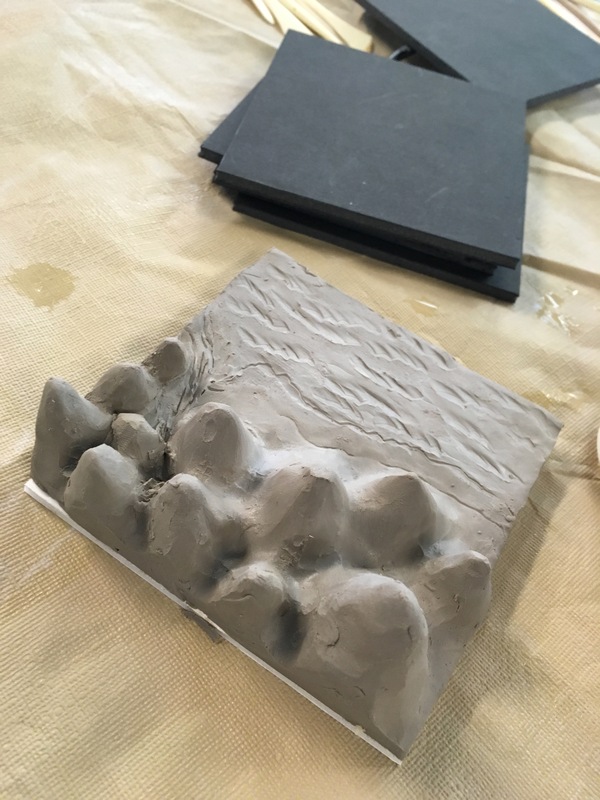 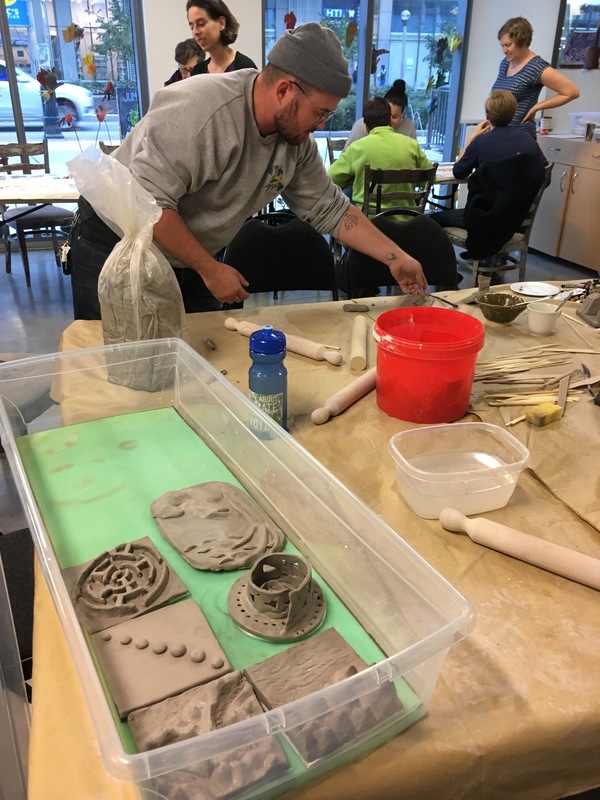 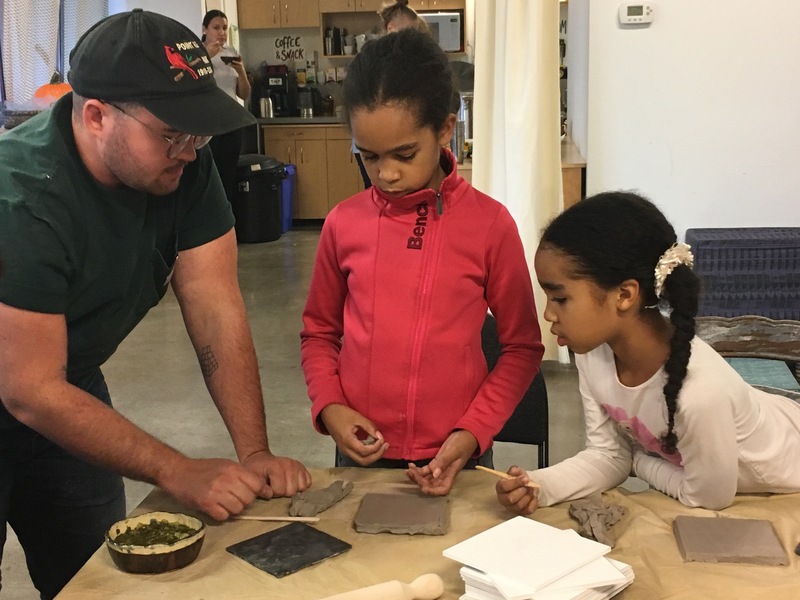 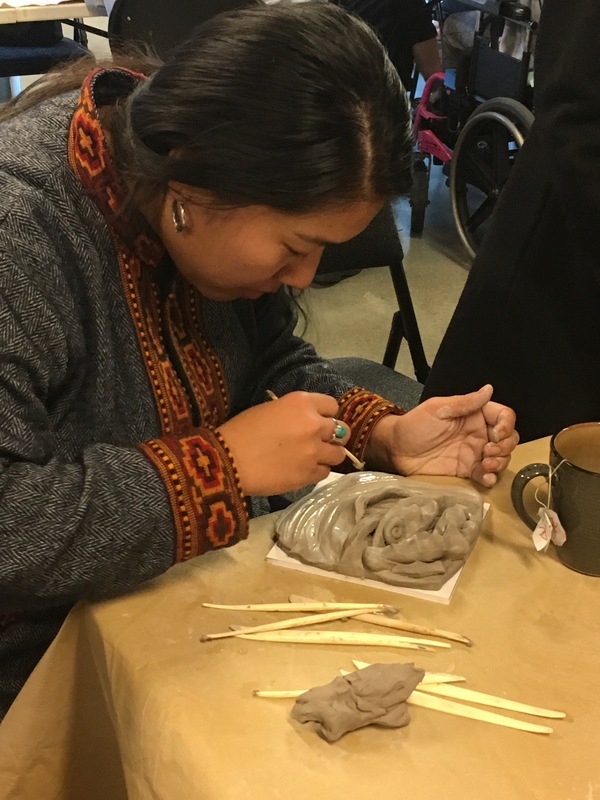 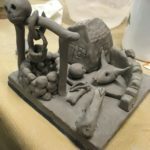 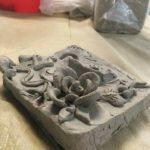 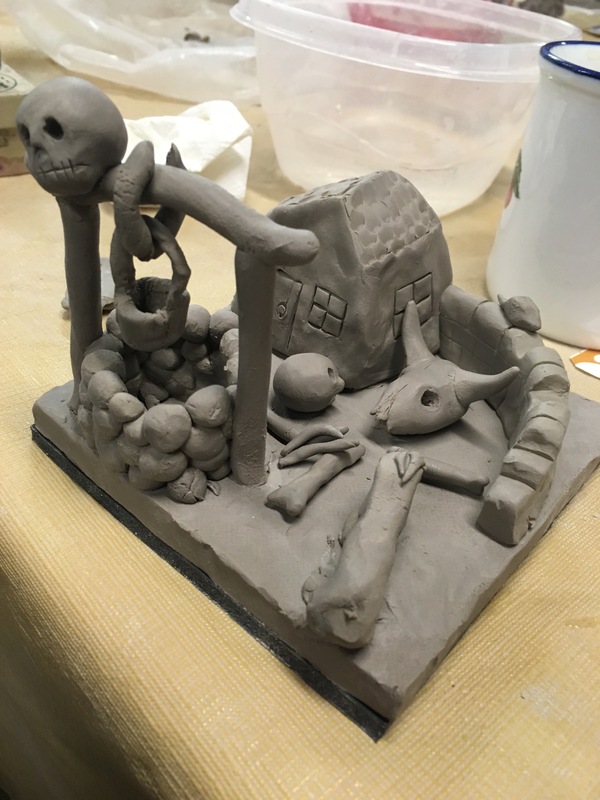 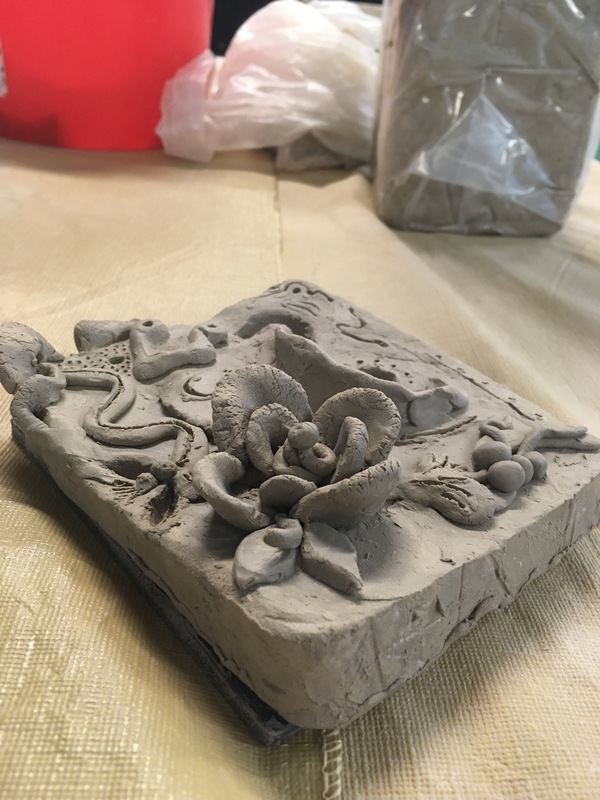 In Fall 2018 we invited artist Parker Dirks, to design and facilitate a new ceramics project for our weekly arts drop-in at The Ground Floor. 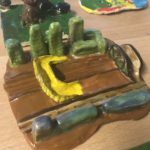 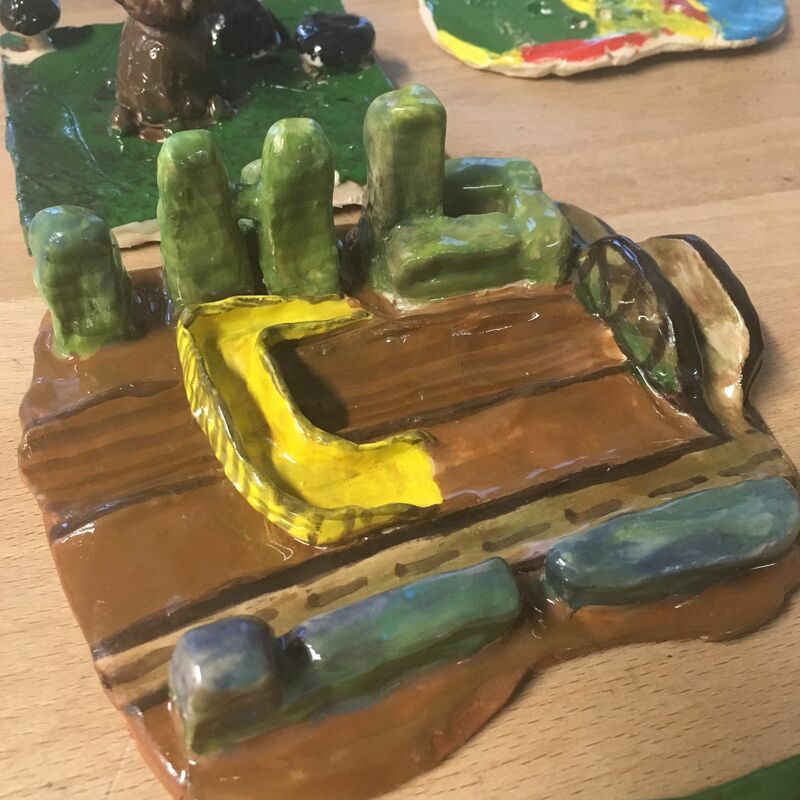 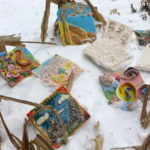 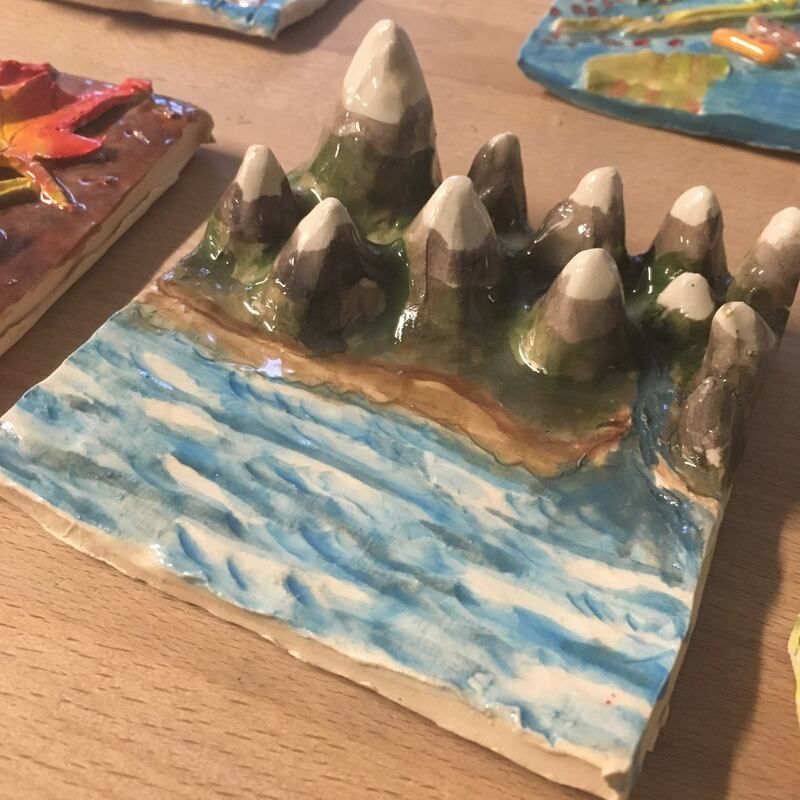 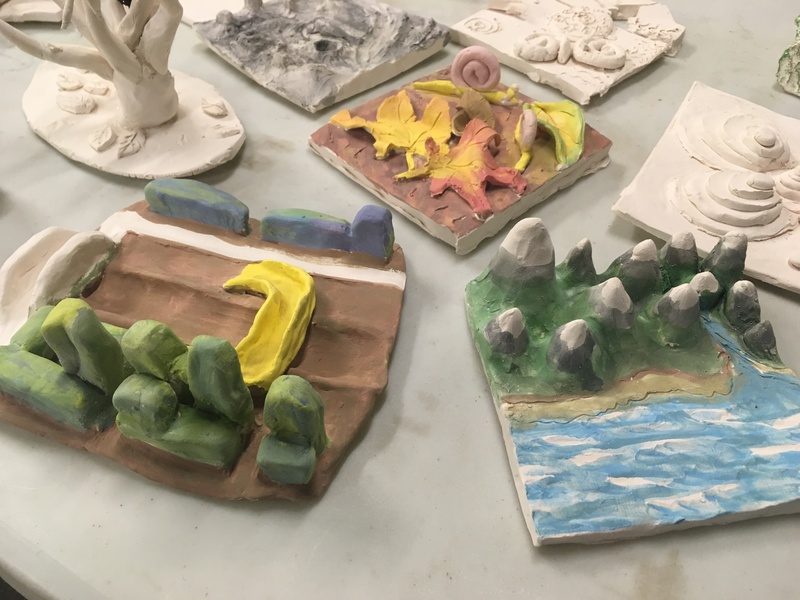 Parker worked with Jumblies’ artists and community participants to make tiles expressing landscapes mingling fantasy, memory and local surroundings. 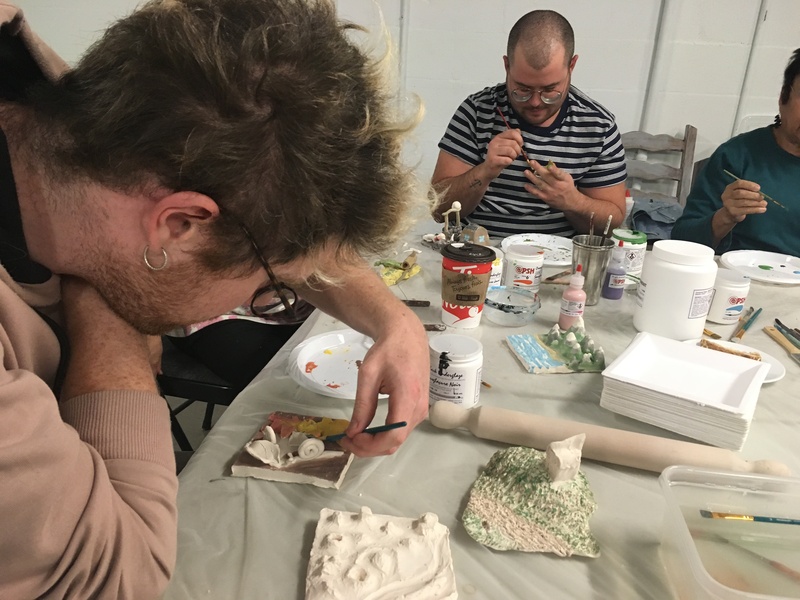 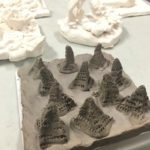 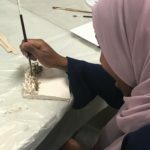 Following a series of weekly workshops, Parker came back for a two-week winter residency, giving people the opportunity to finish glazing their tiles and have them fired. 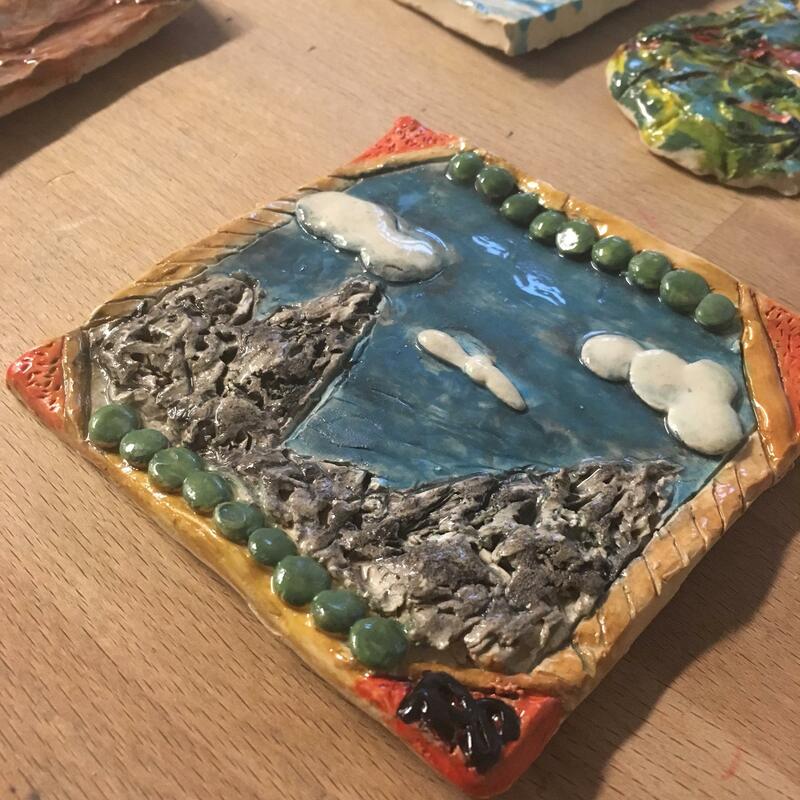 These tile landscapes evolved into whimsical mini worlds, meriting stories, sounds and celebration. 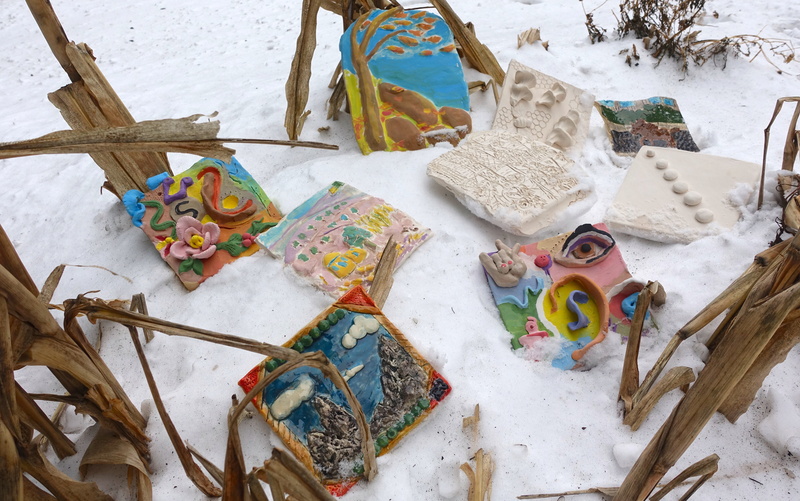 And so we invited some guest and staff artists to respond to them in their own art forms. 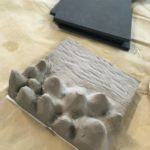 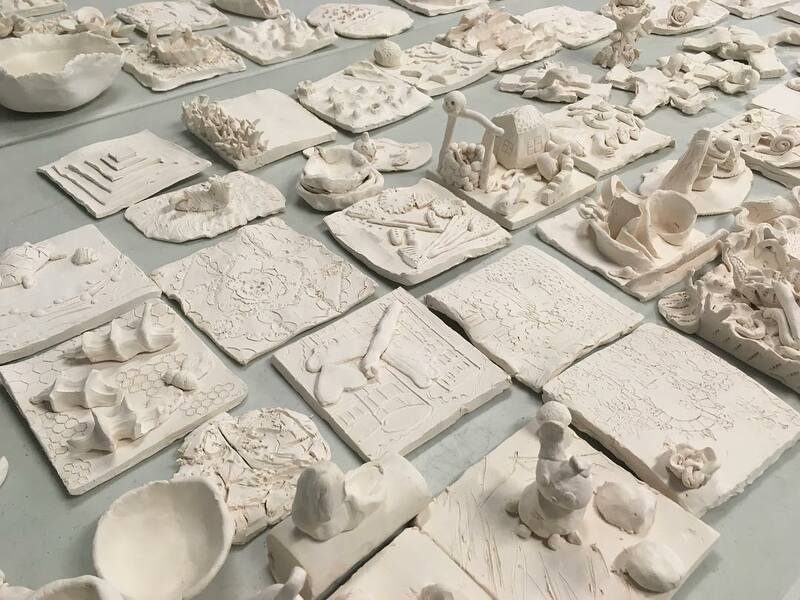 Composer, Alex Eddington, with our our all-abilities community choir, the Gather Round Singers, created vocal fragments, and ambient soundscape created by ceramic fragments. 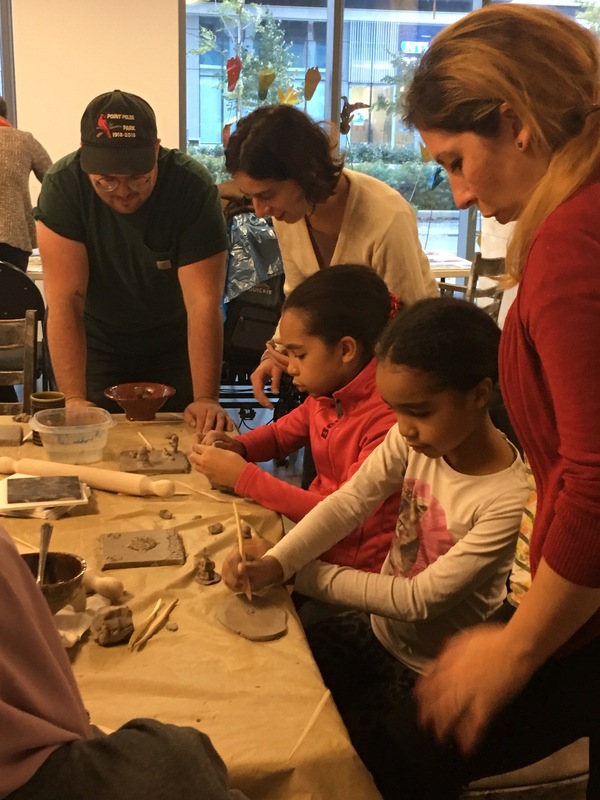 Tijana Spasic, Jamie Oshkabewisens played with animating the tiles through sound, movement, storytelling, colouring and live feed projections.Choreographer, Michelle Silagy, joined us to contribute movement responses to the tiles and their stories. 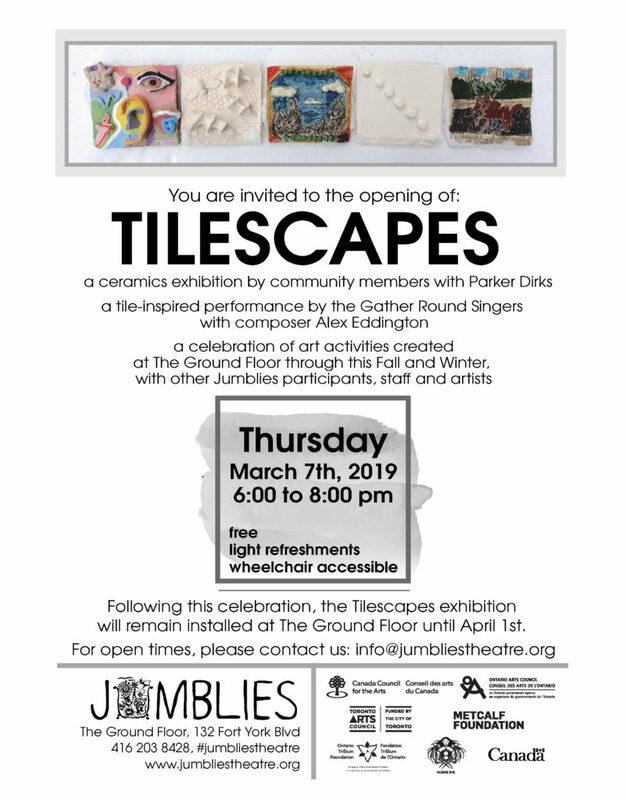 The opening of Tilescapes, on March 7th, is an exhibition and performance event. 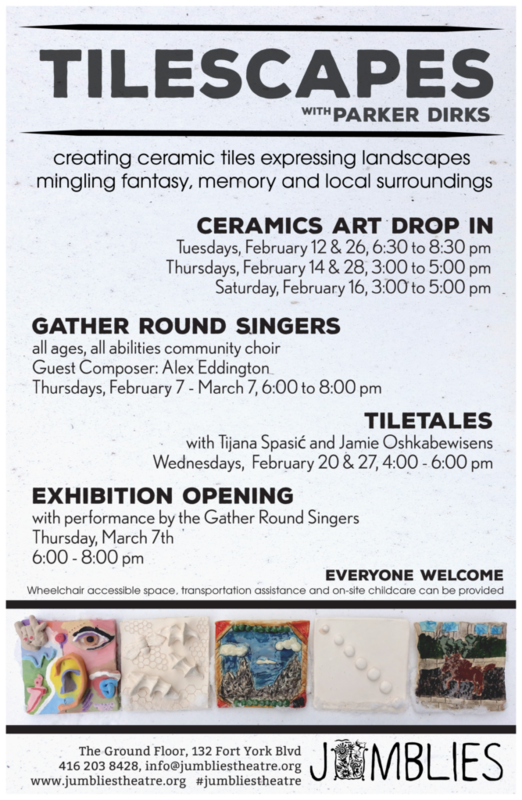 Following this, the exhibition will remain at The Ground Floor until the end of March. 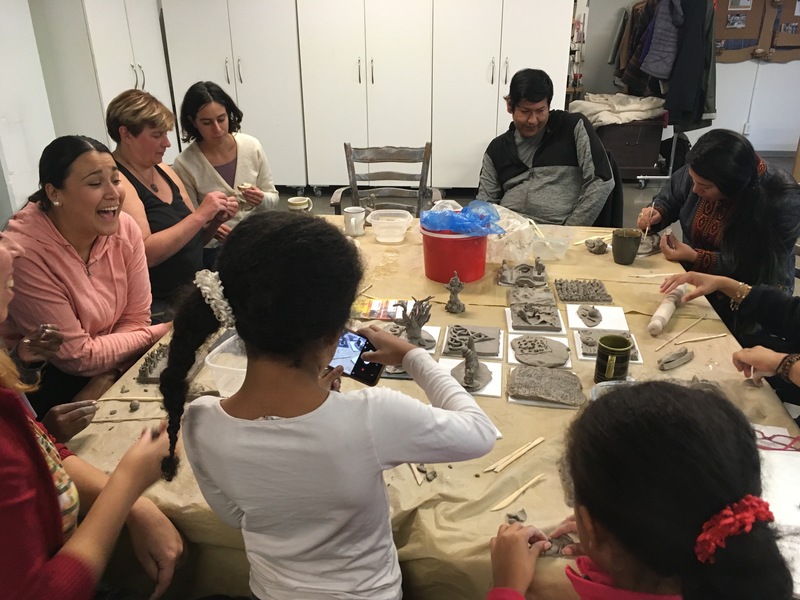 Contact us for open hours, or drop by! 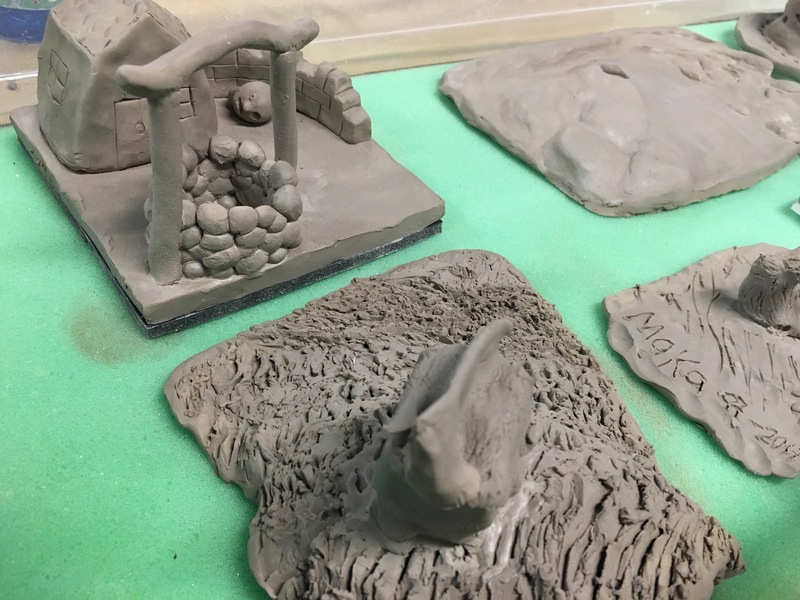 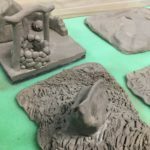 There will be public drop-in sessions, other less formal drop-in options, and a final exhibition and celebration fo the finished tiles, including music and stories responding to them. 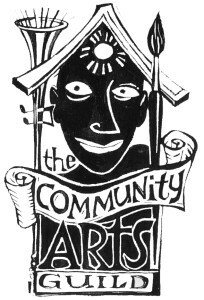 The Gather Round Singers, our community choir for all ages and abilities, started up again with weekly rehearsals on Thursdays, 6 to 8pm. 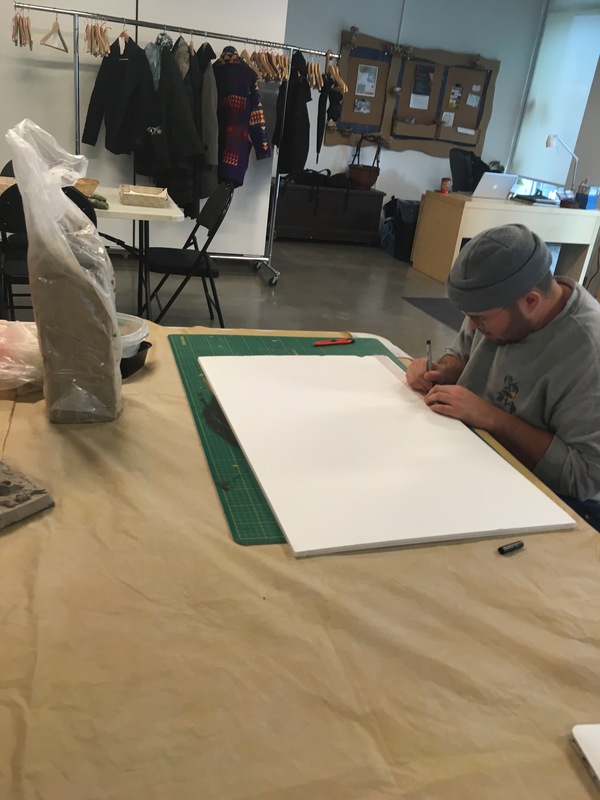 Ceramics artist, Parker Dirks will be in residence in February, finishing up the tile landscape project we started in the fall. 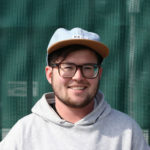 Parker Dirks is a trans interdisciplinary artist, facilitator and technician based in Toronto. 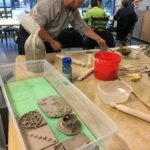 Parker’s practice utilizes mold making, wheel throwing and hand building to create functional craft objects and conceptual sculpture. 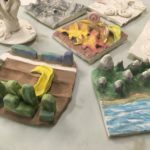 Parker graduated from NSCAD University in 2013 with a degree in Ceramics. 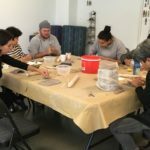 Since then, they have been working as a community arts facilitator, ceramics instructor and technician. 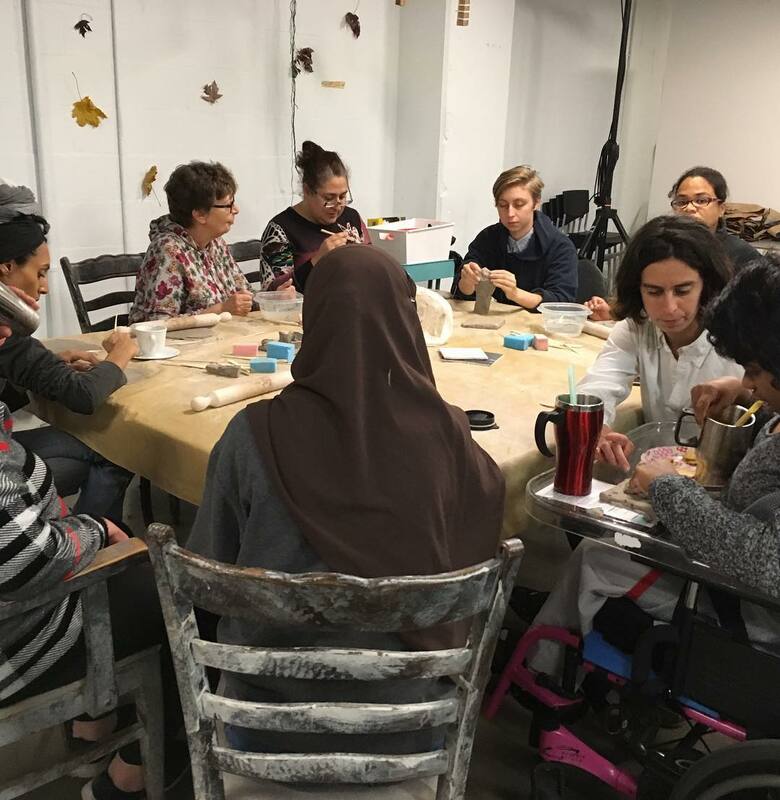 While working in community engaged arts Parker has been privileged to work with many diverse groups of people across Toronto. 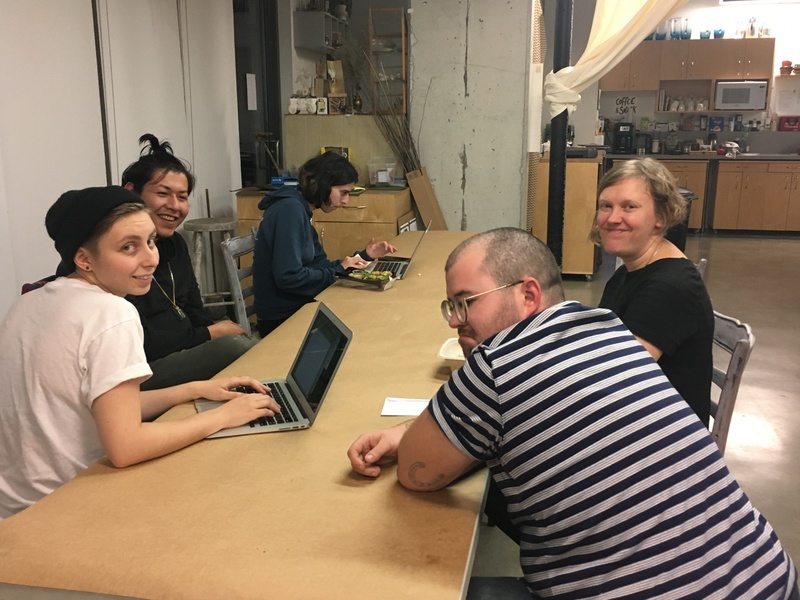 These experiences have led them to pursue a personal art practice focused on investigating ideas of access, transparency, disclosure and gender. 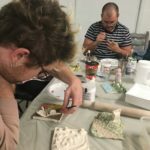 Their current work uses ceramics as a medium to explore and dismantle concepts of binary gender with a critical focus on his experiences as a trans person living in Canada. 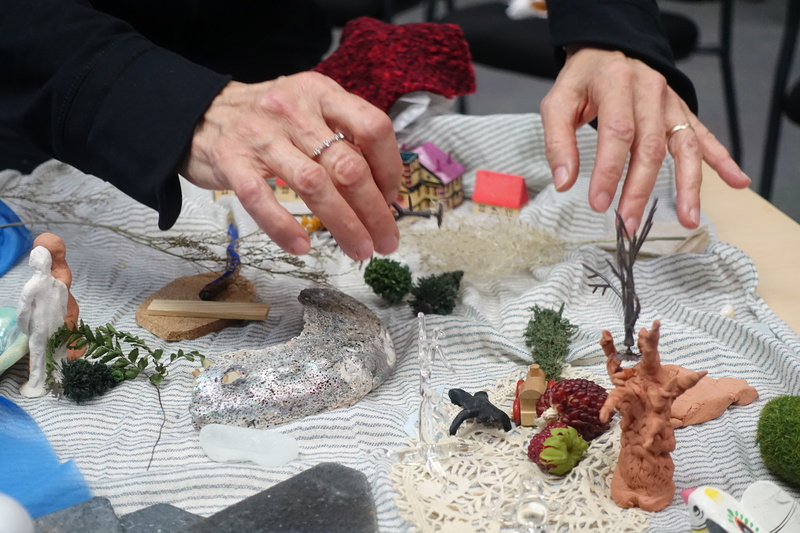 Michelle Silagy calibrates a close relationship among her arts contemporary dance practice and teaching practice of 30 years. 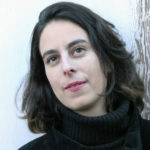 Her choreographic work has been presented in: Amsterdam, New York, the Arctic Circle and throughout Toronto. 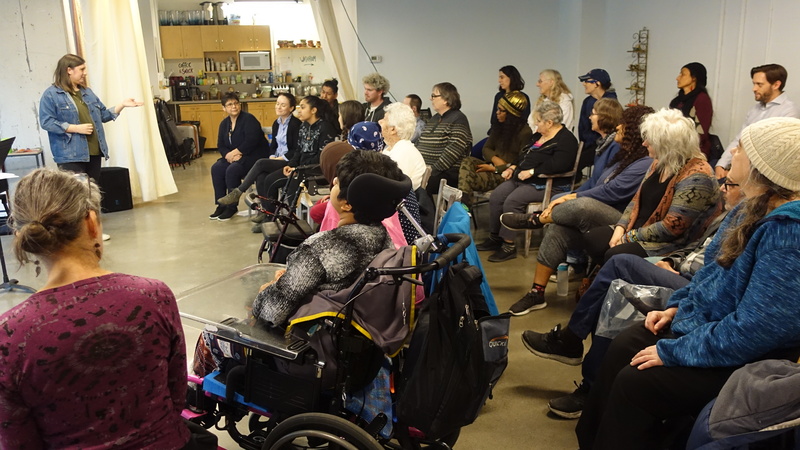 Silagy is one of 10 international artists chosen by DanceAbility International founder Alito Alessi, to become an inaugural Master DanceAbility Teacher in 2015. 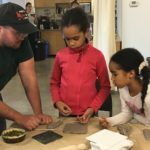 She also directs The Young Dancers’ Program at the School of Toronto Dance Theatre, where she facilitates inclusive movement classes. 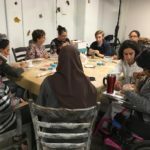 She originated WE Dance, an inclusive dance sessions for adults, in partnership with STDT and Canada’s National Ballet School. 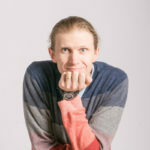 Silagy and Director Lynda Hill co-created Flying Hearts, a relaxed performance for children, which will be performed at the 2019 Wee Festival. 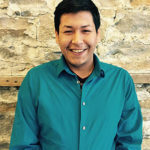 Oshkabewisens, I hale from Wikwemikong Unceded Indian Reserve on Manitoulin Island. 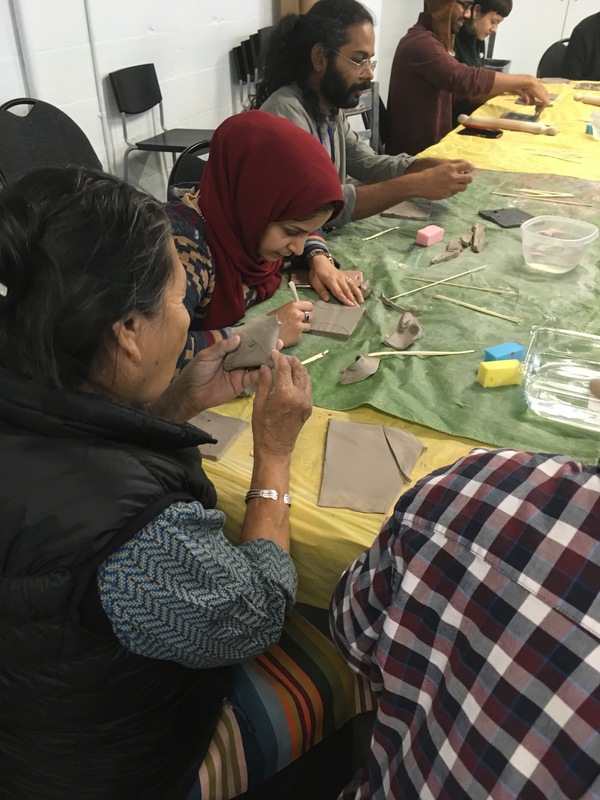 I’ve been in many plays with Debajehmujig Creation Centre, including their production of “Global Savages” (2015). 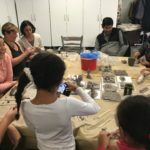 I take part in an annual “Wilder Med Senarios” with the Northern Ontario School of Medicine. 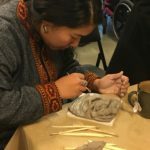 I’ve been in an Arts Educator Foundations workshop with the Royal Conservatory of Music & Debajehmujig, attended the Heritage Interpreter workshop, and part of Jumblies’ 2015 Train of Thought tour. 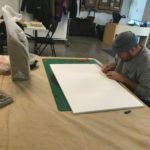 I am now a freelance artist working on my own projects, as well as starting in April 2018 to work with Jumblies for a year, thanks to funds from Miziwe Biik. 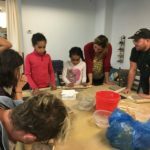 Tijana Spasic lives in Toronto & creates interdisciplinary work all over the city. 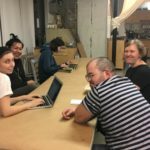 She is a theatre creator, director, and producer as well as an installation artist. 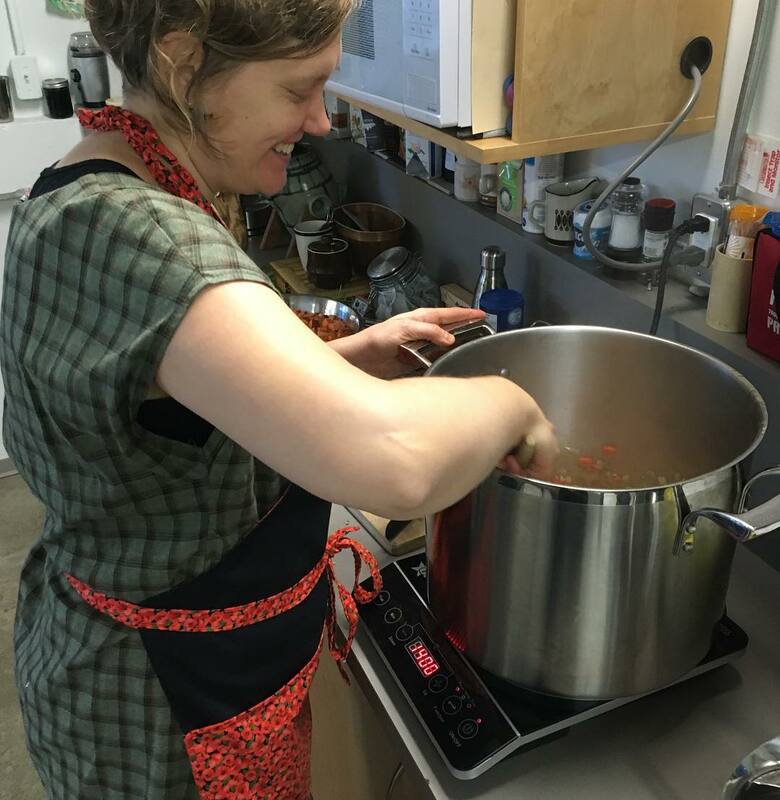 She enjoys creating through collaborative practices, and is passionate about peer to peer mentorship and youth work. 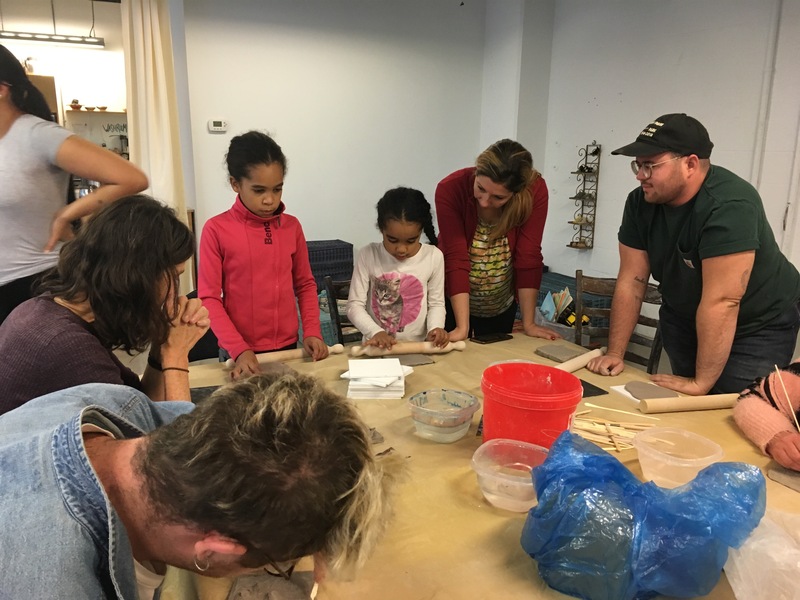 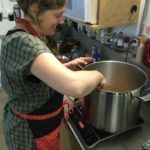 She has led several large scale community engaged arts projects, working in parks, schools, libraries, and a wide variety of other site-specific and traditional venues to create and deliver professional projects and programming created in collaboration with the communities those projects occur in. 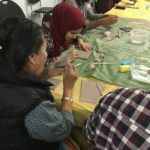 She has worked for Jumblies Theatre, Mammalian Diving Reflex, The Milkweed Collective, bcurrent Theatre and has created projects for: The Edinburgh Fringe Festival, The Powerplant Gallery, Nuit Blanche and The Luminato Festival among others. 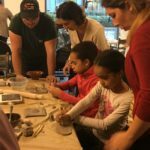 She co-ran the Mashed Collective for three years, running a youth program, and the Living Room Festival: a seven-site festival programming artists of many different disciplines. 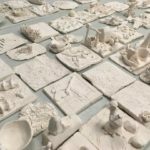 Many of her projects explore the city’s economic disparity, the suburban-downtown divide and questions of family, home and memory. 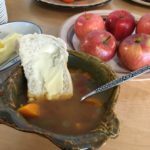 She speaks Serbian and Russian. 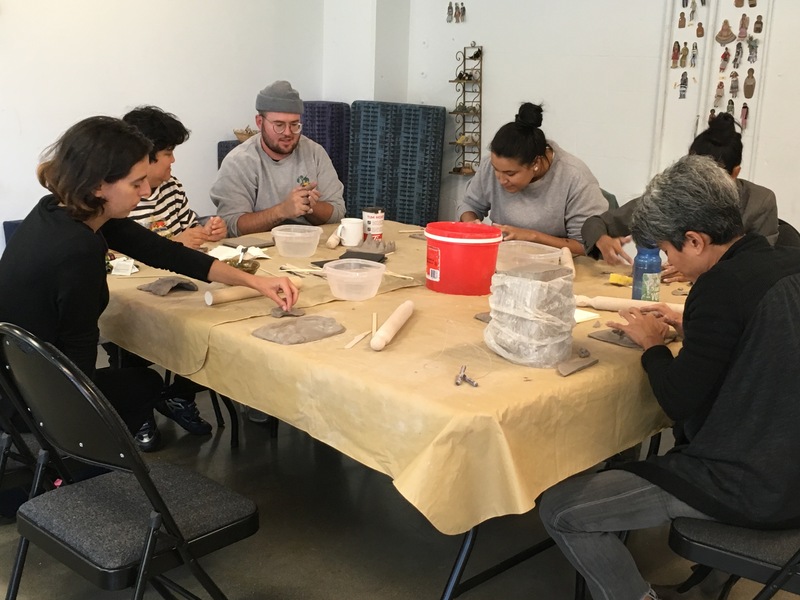 Special thanks to Sketch for the usage of their kiln and also to the students of the Centennial College Community Arts class.